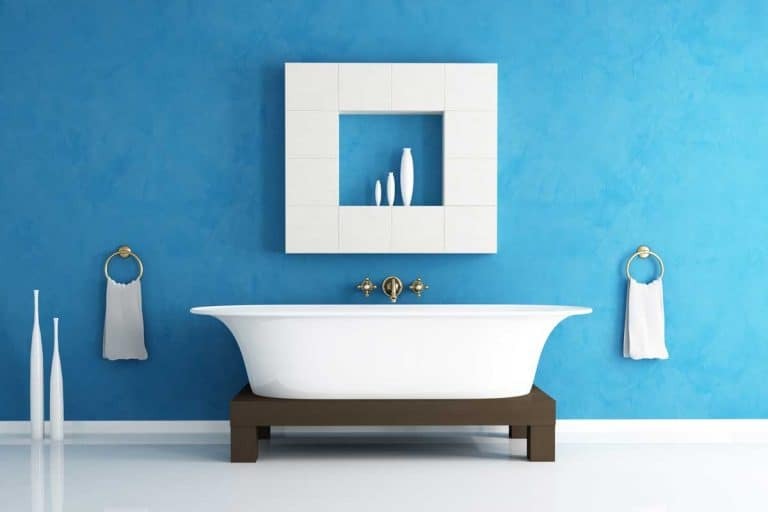 Choosing the beach as the theme for your bathroom decoration project is smart. After all, who doesn’t want to evoke those memories of fun and relaxation for their shower time? Looking for inspiration? We’ve selected the best Instagram images of beach-themed decor. Some of these take the beach theme to the max, others just add a few elements of coastal fun. We hope these will get your interior design inspiration rolling. We’ll start you off with a photo tour of these designs but keep reading for a list of tips based on these images later on in this post. Kicking off the list is this color-coordinated bathroom. The colors of the beach – blue, turquoise and sand – are lead the color scheme but they’re displayed against classic white walls and furniture, so as not to become too overwhelming. The beach theme is then enhanced with clever use of decorative items, including driftwood, seashells, a framed picture of corals and a whimsical sign inviting in the mermaids. Notice the similar color scheme in this classic bathroom. The neutral tones provide a great background for an impressive collection of sea stars and other marine critters. Shelves are a great way to display beach-themed ornaments. If you’re only starting to collect sea stars and seashells, maybe all you need are a few small shelves, like in this. The dark navy wall really brings out the items on display. As you can see, a white background works just as well. We’re going to see a few more beach-themed bathrooms where white is the main color, but for now, this is a lovely example of using beach elements without going overboard. Of course, driftwood is a great material for constructing the shelves. While the shape of driftwood doesn’t always provide a balanced surface, you can easily fix that by placing a small wood plank on top of the driftwood, like here. Speaking of wood and seashells here’s a great way to combine the two into personalized art you can add to your beach-themed bathroom. A great crafts project as you return from a beach holiday – and one that can add a special touch to any room decor. Another way to add that personal touch? Use a frame like this one and decorate with photos from that awesome beach vacation. 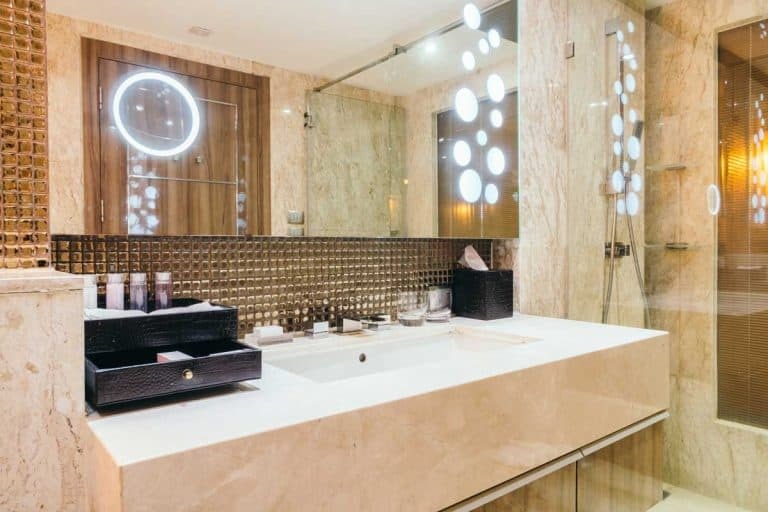 Place alongside your beach-combing trophies for a design element that will make you smile whenever you’re taking a shower. A beautiful beach-themed bathroom doesn’t have to be about sea stars and seashells. Look at this elegant bathroom, for example. The seaside color palette is graceful and luxurious, with white being the dominant color. The pale blue of the waves is reserved for the upper wall areas, while the light brown is used to in details such as the rug, picture frames, and the beach sign. Here’s a thought. You don’t need a “beachy” color palette to evoke the beach. Just look at this gorgeous black and white design above. All it takes is a hint of the sea star shape in the shower curtain. A perfect way to combine minimalist design with the sense of freedom and escape which we all associate with the seaside. Another great example here, with a design which combines the clean white background with natural materials and even plants. And the beach? It’s there in a gorgeous – almost abstract – poster. Granted, this isn’t your typical seaside in the picture, but a dramatic artistic depiction of what appears to be dead trees with the sea in the background. Would you even consider this a beach-themed bathroom? We think it is. And what a refreshingly different take on the theme it is. Another unique take on the beach theme here. This relaxing bathroom in neutral white and earth tones uses natural materials to create an island atmosphere. With a white sea star between the sinks that spells out b-e-a-c-h. Returning from our detour into monochromatic beach designs, another classic here. Note the use of contrasting turquoise cabinet knobs. 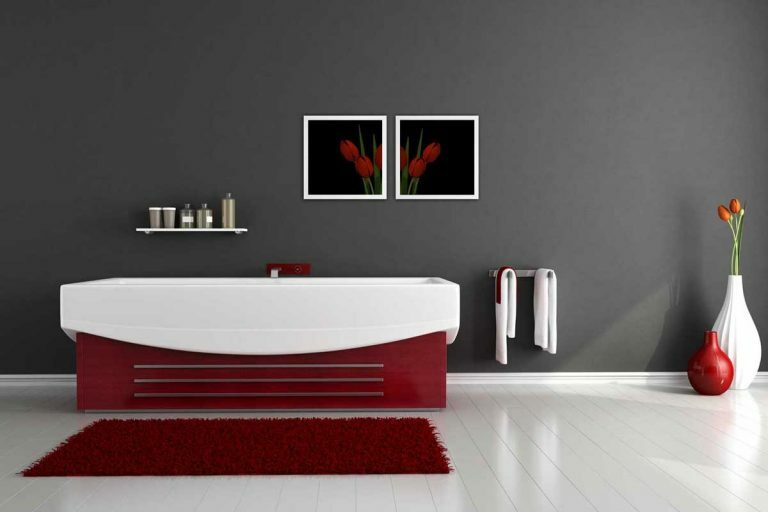 It gives the entire room a retro look and feel – perfect for a kids bathroom. And the three sea stars have a genuine sea sponge to keep them company! More bold colors here! That reddish shade of orange is, in fact, coral – which definitely an ocean element. You could actually say this is a coral-themed bathroom, considering there’s an actual coral on the shelves. We loved the use of contrasting colors of coral and turquoise, the ocean-themed wall decor and the ropes used in constructing the shelves. Coral is a key color in this design as well. This time, contrasted with deep blue. Notice how the design heavily relies on accessories. In fact, except for the reddish cabinet – which in and of itself isn’t necessarily ocean-themed – every other design element is an added accessory. Chained seashells and sea stars are joined by a couple of wall art items and a blue towel. Voila! 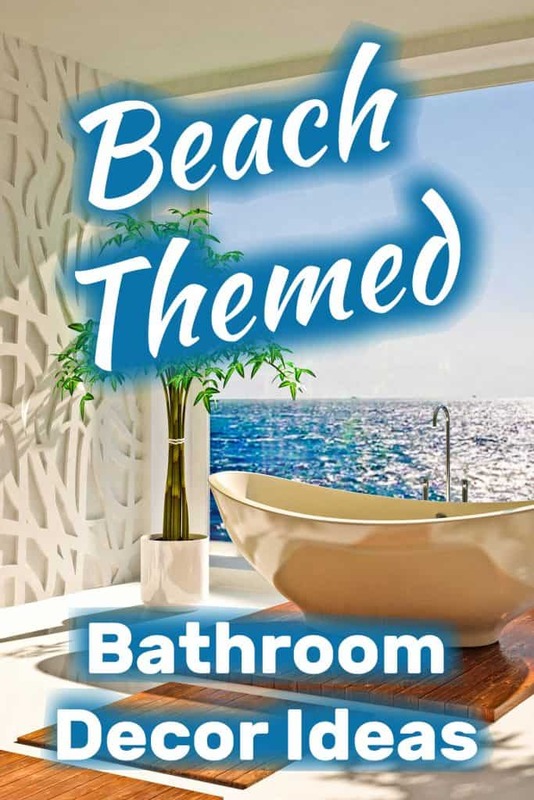 An easy-to-achieve affordable beach-themed bathroom! Wrapping up with a classic beach-themed bathroom. This one brings it all together: A great blue and white color scheme with a fantastic display of seaside-themed decorative elements. So, which practical tips can we take from these designs? Consider a color theme that evokes the seaside. Try combining sand color with light blue, or go wild with coral and turquoise. White is always a good base color in the bathroom, whatever palette you go for. Start with white and add the other colors. Use the classic ocean elements: Sea stars, seashell and seahorses work very well. Get distressed wood into your design. Beach board signs are an excellent way to do that – or you could even use real driftwood. Choose natural materials such as woven baskets for your bathroom accessories. Work your own personal memories from the beach into the room. Add your own beach photos or display the treasures you found while beach combing your favorite seaside resort. It doesn’t take much to evoke the beach in your bathroom. And it’s a great way to create that soothing vibe that will help you relax and unwind.